You might’ve realized around your late 20s that your rapid-speed metabolism was slowing down, and you had to cut back on ordering “fries with that” with every meal. Hormonal changes during menopause can sometimes mean it’s easier to gain weight. Exercise will not only help stave off weight gain, but will also help you make up for the loss of muscle mass that’s common in women experiencing menopause. The Centers for Disease Control and Prevention (CDC) recommends 75 minutes of vigorous aerobic activity per week for healthy women to help maintain a healthy weight. If you want to lose weight, aim for at least 20 minutes of exercise per day. Although both men and women should be concerned about maintaining strong bones as they age, women are at higher risk for osteoporosis. The good news is that working out can help build and maintain bone density. The National Osteoporosis Foundation recommends weight-bearing and muscle-strengthening exercises for those at risk for or diagnosed with osteoporosis. Keep moving. If you exercise regularly now, keep doing it. If you don’t, find a A dip in estrogen levels is common at the onset of menopause. This can increase bad cholesterol and decrease good cholesterol levels. It can also put women at increased risk for cardiac health issues. Keeping in mind that heart disease is the leading cause of death for women in the United States every year. 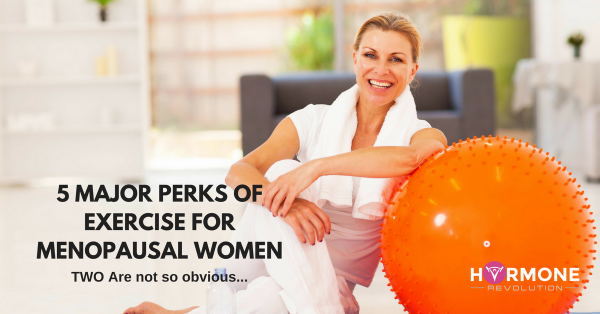 This means menopause could arguably be one of the most important periods to stay in shape. It turns out exercise can actually provide relief from hot flashes. One study showed that women who lived sedentary lives had more severe menopause symptoms than active women. Active women tend to be more focused on their health which has a direct effect on their menopausal symptoms. Another study found that regular exercise could prevent postmenopausal symptoms significantly. So maybe you can even replace your hormone replacement therapy medications with a more natural alternative. Every woman experiences menopause differently, and not every woman feels her best during this time. And that’s OK. But if you’re feeling blue, you’ll be happy to know that exercise can be the pick-me-up you need to help you feel good about yourself. One study found that over time, physical activity was associated with higher levels of self-worth and menopause-related quality of life.